Review: The Boy With Tape On His Face: More Tape – Pleasance Grand, Edinburgh. In just a few short years The Boy With Tape On His Face has become an Edinburgh must-see. 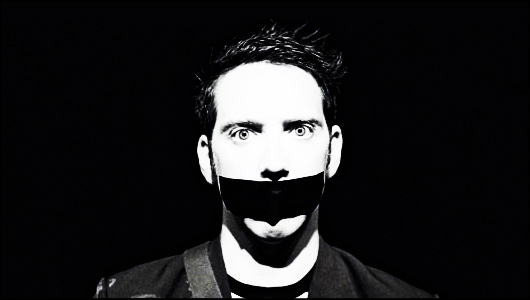 The whole city is a-buzz with Tape Face wonder, and all his five star reviews means tonight’s show at the Pleasance Grand is a sell-out. Sam Wills (a.k.a The Boy) is unlike any comedian on the circuit; he’s a master in silent stand up, a term he coined himself that describes the act better than any reviewer ever could any way. To describe the actions in The Boy’s new show – More Tape – through the medium of the written word makes them sound ludicrous, which is precisely why they are so unbelievably entertaining. Wills’ latest hour gives us even more props, combined with ridiculous audience participation games to watch over in awe. Either stunned silence or raucous laughter is the generally accepted norm at these shows, but seeing as The Boy employs mostly pull-back and reveal prop gags I’ll be giving as little away as possible in this review. I’ll tell you this much, though: if you truly give yourself up and give in to The Boy – and forget yourself and your hang ups for an hour – then you will be presented with an entirely joyful and innocent performance of silent stand up. It’s the way Wills can hold the vast amount of people captive in their imagination for the duration of the show that astounds me; he’s truly the master at controlling an audience, which is telling given the willingness of punters during the interactive segments in the show. It’s such an emotional performance, too, which seems bizarre for an act that can’t talk. But his over the top and exaggerated physical gestures can speak volumes, especially if used to reprimand a poor member of the audience or ‘volunteer’ when they’re getting it wrong. Given what Wills’ does on stage, More Tape is an extremely hard show to review. It’s difficult to strike the balance between expressing how incredible an act this is and revealing the show’s wonderful secrets. But if More Tape doesn’t get nominated for Edinburgh’s top comedy award this year then I’ll be frankly lost for words.